The job of the KL3052 analog input terminal is to supply power to measuring transducers located in the field and to transmit analog measurement signals with electrical isolation to the automation device. The voltage for the sensors is supplied to the terminal via the power contacts. 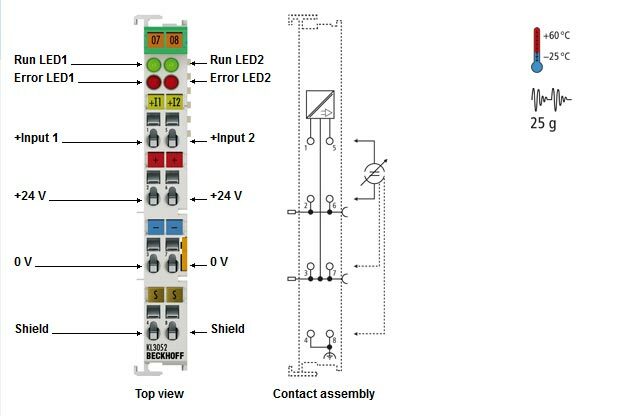 The power contacts can optionally be supplied with operating voltage in the standard way or via a power feed terminal (KL9xxx) with electrical isolation. The input electronics is independent of the supply voltage of the power contacts. The 0 V rail is the reference potential for the inputs. The run LEDs give an indication of the data exchange with the Bus Coupler. The error LEDs indicate an overload condition and a broken wire.